My daughter Whitney and I are morning people. We have a regular routine when we are at home. We wake up just before daylight, and most mornings, my nine year old daughter reads, plays and organizes her dolls and stuffed animals, and sometimes, when I’m not looking, sneaks in a little television. I’m usually sitting in the kitchen poring over emails, reading news websites and planning my work day. For Spring Break this year, my family took an amazing journey to the King and Prince Hotel on Saint Simons Island. The hotel was our home for 4 days. We rode bikes around the island, swam at the hotel pool, visited Fort Frederica and Cumberland Island National Parks and explored the entire island. It was the best vacation my family has ever experienced. But despite all those wonderful activities, my fondest memory were the early mornings I spent with my daughter at sunrise. 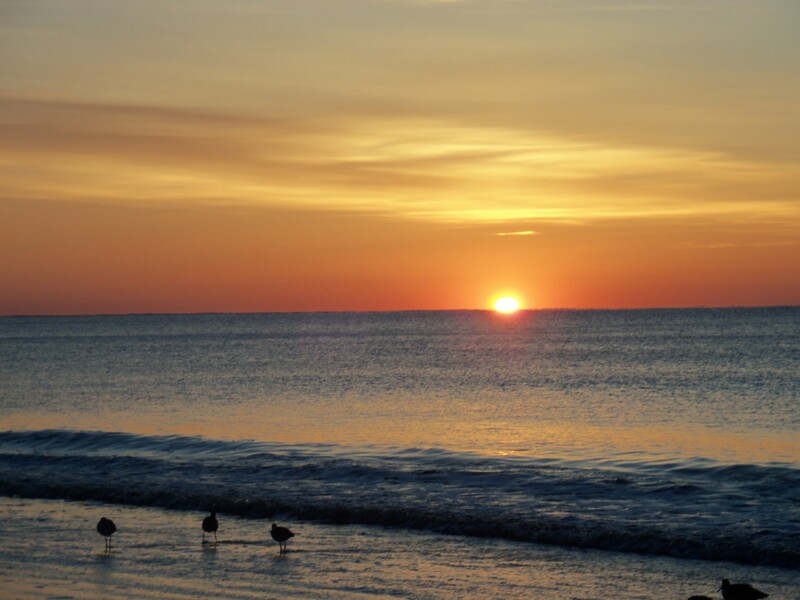 You see, as morning people, we discovered something very special at the King and Prince–the sunrise over the Atlantic Ocean. Each morning, while my wife, who is not a morning person, was sleeping, Whitney and I awoke before sunrise, threw on some warm clothes, and walked a few hundred feet to the beach, holding hands, to watch the sun come up. Three mornings. Three sunrises. Three memories with my daughter that will last a lifetime. Barefoot in the sand, and letting the ankle deep waves rush over our feet, my daughter and I explored the beach, following the plovers, terns and various shorebirds. We found shells. Including the shell of a pre-historic horseshoe crab that at first frightened us, because it looked like a World War I army helmet that had washed ashore. But the highlight of each morning was the sunrise. Each different. The first morning we saw rays of light struggling to breakthrough the grey and cloudy sky, creating spotlights. The sky looked like a laser light show. Then on the second morning the entire sky turned blood orange, the clouds shielding the sun just enough to protect our eyes from looking directly into the sun. We stared at the sun, a fireball, gently rising on the horizon. And on our last day, a clear crystal blue sky. So clear, you could see the streaks in the sky where airplanes had flown. It was also getting warmer. That refreshing day, we could tell spring was coming. morning people. We get up early, I start to work, she prepares for school, and my wife gets a few more minutes of sleep. We are back into our routine. But a couple of times, since coming back, Whitney has hugged me in the early morning before daylight, and asked to see the sunrise. We throw on warmer clothes, clasp hands together and journey outside to explore and watch the sun come up. 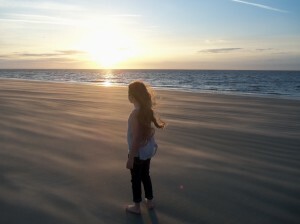 While we watch the sun come up over our city, we remember our special gift from Saint Simons Island, the sunrise, the place and that special time and memory with my daughter. This entry was posted on Friday, April 19th, 2013 at 1:27 pm	and is filed under Area Events and Info. You can follow any responses to this entry through the RSS 2.0 feed. Responses are currently closed, but you can trackback from your own site.